Huzzah for Dreams of Shadow and Smoke! 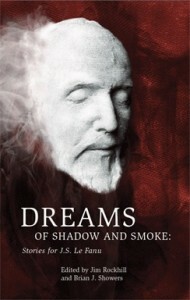 Many and warm congrats to Messrs Brian J. Showers and Jim Rockhill of Swan River Press – their J Sheridan Le Fanu tribute anthology, Dreams of Shadow and Smoke, has won Best Ghost Story Book for 2014 (in 2015, as is the way of such things)!! I believe there are a few copies of this beautiful limited edition remaining. Go here – you know you want to. This entry was posted in News and tagged Brian J Shwoers, Derek John, Dreams of Shadow and Smoke, Gavin Selerie, Jim Rockhill, Joseph Sheridan Le Fanu, lynda e rucker, Mark Valentine, Martin Hayes, Peter Bell, Sarah LeFanu, Swan River Press. Bookmark the permalink.